One of the problems with reviewing so many CDs here at RoughEdge.com, is that sometimes it feels like you've heard it all before. For every CD you get that is fresh and original, there are a dozen that are just the same old thing. 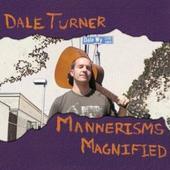 When you've got a stack of 100 CDs on your desk and too many of them sound alike, the occasional surprise -- like Dale Turner's "Mannerisms Magnified" -- are a much-needed breath of fresh air. Before I get too deep into this review, however, let me point something out. If you're reading Rough Edge because you're looking for the hardest and the heaviest music out there, "Mannerisms Magnified" is not the disc you're looking for. There's some hard-edged music on it and some great rock'n'roll but Slipknot it ain't. Most of the music on this CD would fall into the classic rock category which, if your musical taste runs close to mine, is more of a blessing than a curse. There's a little bit of everything on "Mannerisms Magnified." It starts out with a vocal number that wouldn't be out of place on a Burt Bacharach CD from the late 60s. It's a little scary at first; you're thinking "Why the hell did they send me an Easy Listening CD?" But is passes soon enough (running only 0:55) and pleasantly enough and one gets the feeling it's only there for atmosphere, anyway. Things change up dramatically from this point on, with Turner delivering tracks that run from light rock ballads to classic rock epics to David Gilmour-esque musical paintings. What makes this CD great is that, as you listen, you realize you're experiencing one man's creative expression. Turner wrote, recorded, performed, arranged, produced and sang everything here. "Mannerisms Magnified" isn't music by committee or manipulated by some soulless corporation. Instead, this is the CD that Dale Turner wanted you to hear and its originality shines because of it. I've spun it three or four times now and it gets better with each listen. Now I've got to dig back in and hunt for the next gem in my stack of 100+ review CDs. There's some great stuff in there, I'm sure, and I hope it doesn't take long for me to find another CD as unique, exciting and delightful as "Mannerisms Magnified." For more information, check out http://www.intimateaudio.com. Copyright © 2011 by R. Scott Bolton. All rights reserved. Revised: 30 May 2018 21:34:14 -0400.